The new book by photographer Mick Rock is now available to buy. 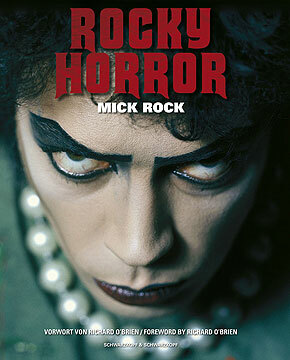 This looks like being the ultimate book of images from the Rocky Horror Picture Show. Rob has kindly written a review of his copy and we will be adding more information about the book very soon. For more images and online buying links please scroll down the page. In my recent review of the 2006 Rocky Horror calendar, which of course features some of Mick Rock's incredible photographs, I said that it served as "a tasty hors d'oeuvre for the forthcoming book". Well, the long awaited main course has finally arrived, and it could not have been more deliciously satisfying. It has definitely been a long time coming; so it is a huge relief that, unlike certain other items of Rocky Horror memorabilia (which stink of exploitation, cash-in and cheap rip-off), this magnificent piece of artistic literature is a fan's dream come true. Invited by director Jim Sharman to serve as "Special Photographer" during production of The Rocky Horror Picture Show in 1974, the legendary Mick Rock was given absolute freedom to turn up on set whenever he wanted and shoot what he liked. As we know, that arrangement resulted in some of the finest photographic images of the film's protagonists. Even Richard O'Brien has said many times that Mick took all the best shots from the movie, and I'm not about to argue with Richard's hallowed seal of approval. Those familiar with any of Mick Rock's other books will have an idea what to expect from the format. There is very little text, apart from the occasional introductory passage from Mick himself (plus a few choice quotes here and there from the likes of Richard O'Brien and Tim Curry), as, quite rightly in a collection of Mick Rock's work, the images are allowed to speak for themselves. Some of the pictures have been seen before of course, while many have not. However, it is the inclusion of so many beautiful images in one irresistable volume that makes this publication so special. One of the things that became clear to me, whilst ploughing through the book's 272 sumptuous pages, is just how unbelievably photogenic every member of the film's cast was. There are some stunning photos of Little Nell (including some lovely candid shots of her with Michael White's son, Josh); Patricia Quinn oozes the cool sensuality that her character demands; Richard O'Brien never looks anything but perfect, age-less and god-like; and it is absolutely impossible to find a picture of Tim Curry (especially one of him in full Frank make-up) where he isn't simply making sweet love to the camera. There are numerous examples of the familiar posed images we all know and love, that have adorned countless posters, magazines and calendars over the years; candid behind-the-scenes photographs, which make a fascinating photographic document of the making of the film; and more relaxed shots of the actors clowning around, including Nell in the swimming pool, and an out-of-character Meat Loaf mugging for the camera. As well as being a gorgeous collectable in its own right, the book also makes an ideal reference manual, as the costumes, make-up and tattoos of the film's characters are shown in exquisite detail, which will always be of particular interest to most Rocky Horror devotees. Possibly the only (and I do mean only) downside with the book is that, unlike a 12 image calendar, it is impossible to pick just a few favourites from the innumerable impeccable photographs sandwiched between its resplendent covers. Apart from the movie, Mick Rock also photographed the second Kings Road cast of The Rocky Horror Show, with Philip Sayer playing Frank (Tim had taken the show to L.A. by then), and while I would have liked to have seen a few of these stage show pictures represented (there's only one and it's very small), the book is actually intended to be a celebration of Mick's work for the film, and it certainly succeeds on this level in every possible way. All that remains is to say "thank you", and, with the ink barely dry on this lovingly put together tome, there really is nothing more we could possibly ask of Mick and Richard. Except maybe a Volume 2. While, I had been excitedly looking forward to reviewing this book, it turned out to be a little more difficult than I expected, as I gazed upon each mouth-wateringly gorgeous page, and realised I had to try and be objective about this near perfect item. Probably the toughest part of penning the review was putting the book down long enough to actually write about it. Without doubt the best 30th Anniversary item that fans of The Rocky Horror Picture Show could have wished for, and no words from me could ever hope to do it justice. 24 X 30 CM / 9.5 X 12"